form*Z pro is a powerful 3D design application featuring a variety of modeling personalities and tools with an easy to use interface to express and communicate your imagination. It is based on advanced 3D solid and surface modeling methods that maintain accurate representations as you progress from design to visualization, layout, animation and fabrication. form*Z pro includes all of the features found in form*Z Jr plus many advanced modeling tools, STEP and IGES translators, animation, layout, network rendering and interface customization. 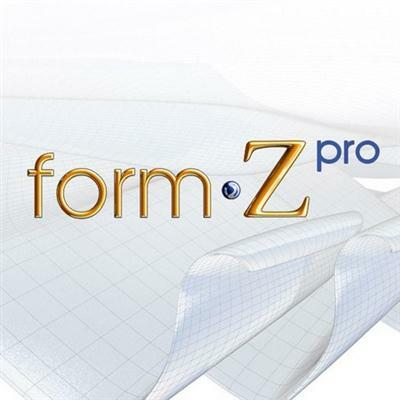 form*Z pro 8 is the latest version that introduces subdivision modeling as yet another modeling personality that enables the quick design and exploration of organic forms that originate from basic shapes. These forms are easily manipulated using a suite of subdivision tools that empower this new personality. - Available for OS X 10.7+ and ShiChuang 7/8/10. - Solid and Surface Modeling tools including Booleans, NURBS and Subdivision Surfaces. - Native support for 64 architecture on OS X allows for more content craetion. - Imports SKP, KMZ, DWG, DXF, DAE, OBJ, SAT, STEP and STL files. - Exports DWG, DXF, SAT, STEP, DAE, and STL for 3D printing. * Accurate robust internal representation of data including 3D solids, surfaces, trimmed surfaces, NURBS and parametric representations. * ACIS modeling engine provides advanced smooth modeling capabilities and reliable internal data representation. * Interactive 3D primitive creation (Cone, Cylinder, Sphere, Torus). * Advanced 3D primitives. Interactively create Paraboloid, Hyperboloids and Hyperbolic Paraboloids. * Deformations alter the shape of an object with the Bend, Bulge, Taper or Twist methods while keeping them a solid accurate object. * Advanced Deformations include Bend Along Path and 3D Morph operations. * The Billboard tool enables the quick placement of an image as a texture in 3d. * Basic Rounding allows for the rounding or beveling an edge of an object. * Advanced Rounding and Blending give much more control over rounding operations and offers blending between faces of objects (fillets). * The Cap tool constructs surfaces across opening in a model. The Cover and Uncover tools convert a wire object to a surface or vise versa. * Lofting tools include ruled, guided, path and branched lofting. * The Derivative tools allow for the construction of an extrusion, convergence or a wall object from (all or a part of) an existing object. * Advanced Derivative tools include point clouds, derivative from parts of objects. The frame tool derives a structure such as a truss or space frame from the edges of an object. * Unfold enables a model to be unfolded (flattened) with tabs and labels for fabrication and easy assembly. The projection tool flattens an object onto a plane. * Revolve is used to derive a revolved or lathed object from a profile (source shape) and an axis. * Helix and Sweep are powerful modeling operations that derive a new shape from the volume that a source object creates as it follows a path. * Advanced Sweep tools (Two Source Sweep, Two Path Sweep, Boundary Sweep, Draft Sweep) offer more flexibility and power the sweep capabilities. * Offset Surface makes a new surface parallel to the original surface. Thicken (shelling) converts a surface into a solid of a desired thickness. * Skinning is a powerful method to create surface or solid objects from a set of source shapes and a set of paths. There are tools for Smooth Skin, Meshed Skin, and Cross Skin. * Booleans allow for the creation of new forms through the Union, Intersection, or Difference of 3D solid objects.The Split, Slice, Line of intersection offer similar capabilities for surfaces. * Stitching enables the joining of surfaces and the creation of solids for a closed set of surfaces. * The Section tools allow for the creation of 2D and 3D sections of models. * Advanced Meshing tools give real control over facets of a model. These include the 3D Mesh, Polygion Mesh, Reduce Mesh and Polygonize tools. * Displacement creates a 3D object by added relief to a meshed surface based on an image creating the effect of the image being pushed through the surface. * Architectural specialty tools include: Stairs, Spiral Stairs, Roofs and Terrain Models. * Architectural specialty tools include: Switchback Stairs. * Engineering specialty tool include; Gears, Screws and Bolts. * Advanced creative design tools to enhance form generation. These tools include Point Scatter, Surface Scatter, Volume Scatter, Voronoi Diagram, Delaunay Triangulation, Wrap Objects and Parametric Map. * Components make it easy to place commonly used items in a model from a library of objects. A set of libraries is provided and users can create and share their own library of objects that they create. Tools are included for placing, creating, exploding, replacing and creating components. * Doors and ShiChuang are special components that make an opening in a wall when placed in the model. * Basic line editing tools: Close, Trim, Join, Fillet. * Advanced line editing tools: Extend, Connect, Remove Point, Insert Segment, Tangent Line, Perpendicular Line. * Measure tools for distances and angles within and between parts of the model. Calculations of surface area and volume of objects. * Mass Properties calculations include weight, principal axis and moments of inertia. * NURBS Loft and Reconstruct. * NURBS curve tools: Curve Create, Reconstruct, Blend, Merge, Extend. * Advanced NURBS curve tools : Curve Convert, Attach, Split, Insert Knot, Edit Curve, Blend Curve to Point, Convert to Arcs NURBS by Formula. * NURBS surface tools: Surface Lofting, Boundary, UV Curves Convert, Nurbs by Cross Sections, Reconstrcut, Curve Extract, Blend, Merge, Extend. * Advanced NURBS surface tools: NURBS by Formula, Split, Edit Surface, Insert Knot. * 3D Text Creation, Editing and Search and Replace. * Advanced 3D Text tools: Text Along Path, Parallel Text, and Text Between Two Paths. * The transformation suite of tools includes Move, Rotate, Uniform Scale, Independent Scale, and Mirror. These can be applied to objects, ligts, cameras and guides as well as object parts. * The Extend tool allows you to expand an object to an adjacent object. * Advanced transformations such as transformation macros that allow for a set of transformations to be defined and then re-applied to any object in the project. * The Align/Distribute tool aligns them or distributes a set of objects based on a variety of optional criteria. * The Place Along Path and Place On tools create copies of objects along a path or on the faces of an existing object. * The Object Doctor tool analyzes objects for problems such as duplicate points and other hard to find problems commonly found in some models created in other applications. * The Project Doctor analyzes the objects in a project and identifies potential problems such as duplicate objects. * 3D Print Prep tool identifies and fixes problems in a model that would prevent the model from being sent to a 3D printer. * Hatch attributes for objects. A hatch is a graphic technique used to create effects on surfaces for illustration purposes. * Line Weight and Line Style attributes for all objects. * form*Z pro v8.5 introduces a new suite of creative design tools to enhance form generation. These tools offer a variety of ways to create new and interesting forms especially when combined with each other. These tools also work well with many existing form*Z pro tools like subdivision surfaces and deformations to make even more interesting forms. * The Voronoi diagram tool creates a formation of cells from a set of points. * The Point Scatter, Surface Scatter, and Volume Scatter tools create formations by distributing copies of objects on or inside of other objects. * The Parametric Map tool allows 2D objects to be mapped onto a surface or face of another object. * The Wrap tool creates a new object from the 3D spatial boundary (or convex hull) of a set of objects or the 2D boundary of a planar set of points. * The Delaunay Triangulation tool creates robust triangulated meshes from a set of points on a surface or plane. * The form*Z pro Layout environment has been migrated to its own app. The new form*Z Layout app includes numerous improvements plus a title block feature including a library of ready to use title blocks. Commonly used title block text can be auto filled from a user-defined dictionary. * form*Z pro v8.5 includes an interface for the Augment reality app. With Augment, you can visualize your form*Z models in real world settings, at real size, in real time on OS X and Android mobile devices. * The Hidden Line rendering in form*Z pro v8.5 has been improved to allow interactive view navigation and can optionally show hidden/back edges as dashed lines. * Requires Macintosh with Intel processor and OS X 10.7.5 or later.